Just like Humans have their sensing organs, the automobiles have their measurement tools by which they sense the environment and status of their machinery. 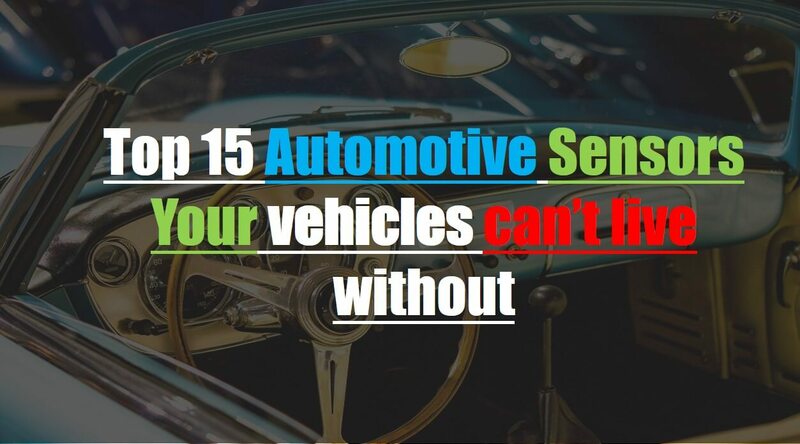 Given below are top 15 automotive sensors which are vital for cars, vehicles and other automobiles. An airbag sensor is a safety device which senses the collision/sudden deceleration of car and quickly inflates so as to provide soft cushioning. Airflow meter measures the flow of air through any device per unit area. The internal combustion engine of automobiles contains airflow meters that determine the required air. The air-fuel ratio gauge measures the optimal stoichiometric ratio for optimal fuel mileage for providing maximum efficiency of the engine. While driving the vehicles there is some potions road where traffic can’t be observed directly or from side/rear mirror. Technically these locations are termed as blind spots. A blind spot monitor detects the traffic coming from sides as well as it notifies you about cross traffic alerts. The crankshaft is an electronic sensor employed in petrol and diesel engines to monitor the position of the crankshaft. The engine takes this information and controls the fuel injection of engines. A crankshaft sensor plays a key role in working of the automobile and, a malfunction sensor results in poor performance of the car. Engine coolant temperature sensor (ECTS) measures the temperature of the coolant in the cooling system. ECTS is a variable resistance sensor whose resistance changes with the temperature. Engine control unit (ECU) provides a variable voltage to ECTS and monitors the conditions of ECTS and thus coolant temperature. The ECU then uses this data to control fuel timings and fan switching on/off conditions. The fuel level detector comprises a potentiometer connected to a float. During its working, an electric current is sent to a potentiometer. The actual resistance of circuit depends on the level of fuel using which the fuel level is measured. it is actually a microphone which listens to the knock spark of an engine. Light sensors are built in modern automotive vehicles and are responsible for automatic switching on/off operations of car lighter in dawn/dusk conditions. Such sensors detect when it’s getting dark in outside environment and switch on the lights. They also control the light illuminance under various settings thus providing an efficient and effective light. The oxygen sensor measures the exhaust-gas concentration of oxygen for internal combustion engines in automobiles. Hotbox and hot detection system: A system which detects overheating of the axle bearing on the railroad. TBOGI system: A system which monitors the working of boogie. TPS (TP for Throttle position) monitors the throttle position of the vehicle. It determines the rotational speed of automotive wheels.